So many remarkable houses! The U.S. has thousands. Built by barons of industry, adventurous architects, and wealthy eccentrics, they may have stately architecture, sumptuous interiors, eclectic style, gorgeous grounds, historic significance, or be a combination. This selection focused on 25 examples, in all regions of the country, with a unique visual appeal, homes whose lives are often as fascinating as that of their original owners. "You must have Mount Vernon," said Susan Weber, the founder and director of the Bard Graduate Center for Studies in the Decorative Arts. "It's beautiful, and the spot is fantastic." She was warming to the question posed – which historic houses in America did she admire? "And you must have the White House." In the end, not really. The United States may lack the medieval castles and wondrous palaces of Europe, but it boasts hundreds of noteworthy homes. For its 25th anniversary, Traditional Home decided to shine a light on 25 of them, all open to the public. It turned out to be easy to go beyond the most famous ones, like the Biltmore Estate, in Asheville, N.C., the Breakers in Newport. 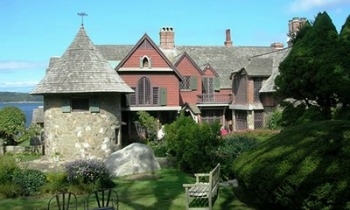 The Isaac Bell House in Newport, R.I., is a favorite of Ian Wardropper, director of the Frick Collection in New York. This 1883 McKim, Mead & White Shingle house doesn't immediately look exceptional. But, says Wardropper, "The inside is really interesting – you see all the bare bones of the architecture. And they had flights of fancy: they took traditional Japanese frying pans and made them into light fixtures," for example. Castle Hill, a far more glamorous "Great House" on the coast in Ipswich, Mass., epitomizes the landscaped summer estates built in the American Country Place era, circa 1840-1930. This 1928, 59-room Stuart-style mansion is furnished in period antiques, including ornate, imported woodcarvings by Grinling Gibbons (1648-1721), whose work also graces Hampton Court Palace and Blenheim. The Lincoln name adds allure to Hildene, in Manchester, Vt., built by the president's son, Robert Todd Lincoln in 1903-05. This Georgian Revival stately home, whose entrance hall has a working 1,000-pipe organ, is furnished mainly with Lincoln family furniture. Outside there's a formal garden planted to resemble a multi-colored stained glass window and, touchingly, a rectangle of bricks that occupies the same space as Honest Abe's birthplace. Naumkeag, in Stockbridge, Mass., is a pick of architect Annabelle Selldorf, renowned for her work renovating historic properties. "It is a Stanford White Gilded Age 'cottage,'" she said, "an excellent example of the Shingle style with well-maintained interiors that really show how people lived at the turn of the century and beyond." 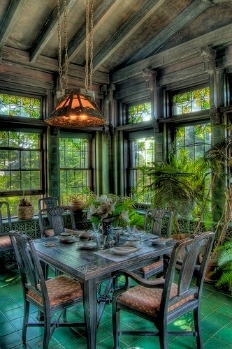 Built in 1885, Naumkeag's rooms are paneled in cherry, oak, and mahogany. "The house beautifully situated with a combination of pasture land and formal gardens including the wonderful 'Blue Steps' by Fletcher Steele," a series of four, deep-blue fountains, flanked by stairs, that descend into the gardens. Decorator Mario Buatta loves Beauport House, the home of Henry Davis Sleeper, one of the first male decorators in the United States. Overlooking the harbor in Gloucester, Mass, "it's a charming, charming house," Buatta says. "It's a 40-room house, and it's a miniature version of Winterthur," the Delaware estate of chemical company heir Henry Francis du Pont. "They were friends and collected together." Beauport's curiosities, from folk art to china to silhouettes, fill every nook, cranny and alcove. Winterthur, however, is a majestic 175-room mansion that houses what may be the world's best collection of American decorative arts. Its masterpieces of furniture, porcelain and glass date from the 1600s through the 1800s, and the house abounds in notable features, including the stunning hand-painted 18th-century wallpaper in the Chinese Parlor, historic millwork and a two-story spiral staircase. Weber suggested a folly, specifically Fonthill in Doylestown, Pa. Between 1908 and 1912, tile maker Henry Chapman Mercer created this 44-room castle, which except for its 200-plus windows looks like a fortress. But it's the mazelike interior that's so engaging: along with built-in furniture, it's decorated with Arts-and-Crafts-style tiles and filled with Mercer's collectibles, including Mesopotamian cuneiform tablets and ceramics embedded in the concrete. Cairnwood, built between 1892 and 1895 in Bryn Athyn, Pa., was designed by Carrère and Hastings, the premier architectural firm for Gilded Age mansions, to look like a French chateau. Inside, the two-story great hall features a vaulted ceiling, a massive carved stone fireplace, and three arched doorways that lead to a flagstone terrace and manicured lawn. Other rooms exhibit rich brocade wallpaper, details trimmed in gold leaf and mantles of Siena marble. 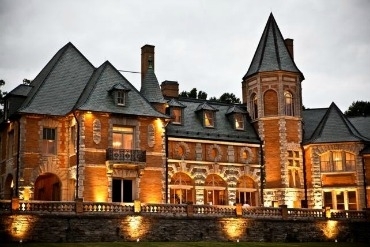 With its sweepings views of the Catskill Mountains and Persian-inspired design, Olana, artist Frederick Edwin Church's well-preserved domicile above the Hudson River in New York has charmed from its start in 1870. "There is no more important site to the Hudson River School of painting," Weber said. "I like the Moorishness of it, and you can see where an artist worked and lived." Surrounded by 250 acres that Church designed, Olana contains many original furnishings and paintings. At Thomas Jefferson's Palladian Monticello, in Charlottesville, Va., "the furnishings, the architectural work and the amazing site all work together," Weber said. "Through the house, which is very idiosyncratic, you can see the mind of Jefferson working." For example, "He had a dumb waiter at the foot of his bed that had 40 different outfits. He could spin it around and get dressed quickly," she marveled. "He had absolutely divine taste. He has his furniture from Philadelphia, but he also has English and French things – and not too much of it." Vizcaya, in Miami, is a choice of Elliot Bostwick Davis, chairman of the Art of the Americas department at the Museum of Fine Arts in Boston. "It was a way to do Venice in the U.S.," she said. Built on Biscayne Bay between 1914 and 1922, this palatial property reinterprets an 18th century northern Italian villa for the subtropics. Surrounding the central courtyard are 34 rooms showcasing some 2,500 pieces of Italian decorative art – including the rare Admiral Carpet, woven in the 1450s. Curving stairs lead to the entrance of the Harper Fowlkes House, an 1842 Greek Revival mansion in historic Savannah. Inside, a columned central hall, with Georgia marble floors, leads to a large double parlor, furnished with the original marble consoles, gilded mirrors, and a 1740 Queen Anne-style chair. The house is famous for its chandeliers, made around 1847 by Cornelius Company in Philadelphia. Drayton Hall, a Georgian pile built in 1738, remains in its nearly original condition, with a design inspired partly by English architects Inigo Jones and William Kent. Among the notable features is the hand-molded c. 1742 ceiling in the "withdrawing room." Bordered by meandering vines and urns, it includes a central medallion with a design featuring corn. Named for an 800-ft-long allee of live oaks dating to the 1700s, Oak Alley Plantation on the Mississippi in Vacherie, La., provides a glimpse of the Old South. 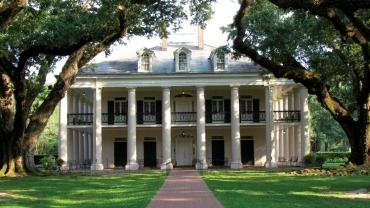 The Great House, erected between 1837 and 1839, is Greek Revival with French Creole touches. Twenty-eight Doric columns surround the square, symmetrical mansion, which features a spacious second-floor gallery overlooking the allee. Andrew S. Dolkart, architectural historian at Columbia University, chose the Alden Dow House, in Midland, Mich., rather than a Frank Lloyd Wright house: "I love Wright, especially the Dana House in Springfield, Illinois and the Darwin Martin in Buffalo, but these houses are shown as such precious relics that the visitor is afraid to breathe." Dow studied briefly at Wright's Taliesin and, Dolkart says, "His house is shown as a home. Visitors can sit on the furniture and are free to walk anywhere. Money was no object here, and the house descends into an artificial lake and is filled with amazing detail and furnishings." Completed in 1887, the Glessner House in Chicago was designed by Henry Hobson Richardson, the foremost proponent of the Romanesque style in the U.S. He used rough granite blocks to form a U-shaped home, adding arches and columns as functional ornamentation, and created a large inner courtyard that gave the inhabitants privacy from the city. 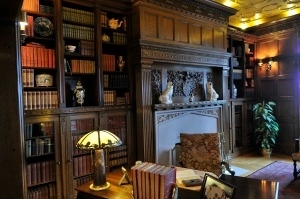 Inside, there are English and American arts and crafts objects by the likes of William Morris and Isaac Scott. The five-story James J. Hill House, in St. Paul, is another Romanesque showplace, with 22 fireplaces, 16 cut-glass chandeliers, a two-story art gallery, an 88-foot reception hall, and a dining room with a hidden door to a walk-in safe. The elaborately carved grand staircase is just one example of intricate oak and mahogany woodwork that abounds in the house. On the shores of Lake Superior, in Duluth, sits Glensheen, a 39-room Jacobean Revival home, built in 1905-08. The inside is a cornucopia of woodwork, panels and trims in oak, walnut, mahogany, cypress and more, and much of the original furniture is there, as are the rich wall and ceiling coverings and the 1908 art collection. Michael S. Smith, the Santa Monica-based designer whose clients include the White House, singled out the Larkin House, an 1835 adobe brick box with a veranda encircling the second floor, in Monterey, Ca. "It is a perfect example of the beginning of relaxed California architecture," Smith said. "It is a simple form in a beautiful location. Each floor is decorated beautifully, with many delicate yet meaningful French and Asian antiques" from the early 19th century. 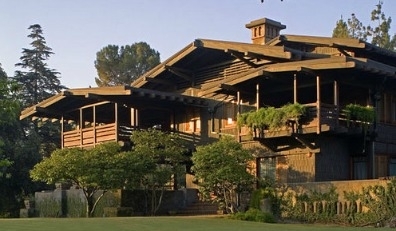 With both structure and furnishings designed by Charles and Henry Greene, the Gamble House in Pasadena – created in 1908 for heirs to the Procter & Gamble Co. – represents the apogee of American Arts and Crafts-style, the "new and native" architecture the Greenes invented. A leaded glass Tree of Life door lead to a home in warm woods (teak, mahogany, redwood, ebony, maple), outfitted with furniture designed to occupy specific spots and upper-level sleeping porches. Well known for its gardens, Filoli, in Woodside, Ca. is also one of the west's grandest abodes, a Georgian English country estate with a Spanish mission tile roof and an Italian baroque entrance portico. In its 43 rooms are 17 fireplaces, carved moldings, inlaid parquet floors, and high ceilings that rise from 17 feet in most major rooms to more than 22 feet in the ballroom. Hearst Castle, on a hilltop in San Simeon, Ca. is a pastiche of many styles, and with its 56 bedrooms, 61 bathrooms and 19 sitting rooms, represents the height of excess in the early 20th century. Ceilings, tiles, furniture and furnishings were bought back by Hearst from churches, monasteries and palaces in Europe to make this dream estate.